The ABC removed Emma Alberici's analysis criticising the need for corporate tax cuts from its website, after complaints from the Turnbull Government (screen shot via abc.net.au). 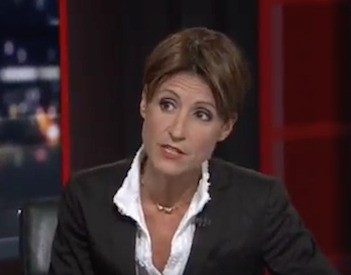 Turnbull's attack on Emma Alberici for daring to tell some uncomfortable truths is indicative of a global pattern of undermining public institutions and censoring independent journalism, writes Mr Denmore from Failed Estate. WHO WOULD HAVE THOUGHT an analysis of corporate tax policy would set so many pulses racing? Perhaps it was a form of group therapy for the nation after weeks of seeking to shut out images of the Member for New England Barnaby Joyce indulging in "country matters". But ABC journalist Emma Alberici’s analysis piece criticising the need for corporate tax cuts in Australia when so few companies pay any has certainly provided a needed distraction from our recent diet of beetroot. @ABC This is a great article why did you pull it. Weak effort all around. As economics journalist Greg Jericho has pointed out, Alberici is hardly alone in making the case against corporate tax cuts. Neither are her arguments a reflexive, innumerate and leftist simplification, as some of her critics at The Australian and the Financial Review have variously claimed. The fact is there is a serious international debate about the effects on liberal democracies of the increasing pressure on governments to provide greater and greater tax relief to footloose global capital. None other than International Monetary Fund (IMF) Managing Director Christine Lagarde has warned in recent days of a global “race to the bottom” as governments seek to match the Trump administration’s tax cuts. "You need public money. The race to the bottom is not conducive to those investments and to helping prepare the workforce and our societies for this new economy of tomorrow." The ABC’s editorial director Alan Sunderland was at pains to say the decision to pull the article down had been made independently by senior management, due to “editorial problems” related to the broadcaster’s policies differentiating factual reporting analysis and opinion. Genuinely perplexed about what these “editorial problems” were, a few of us on Twitter challenged Sunderland to be more specific. As far as academic economists like John Quiggin were concerned, the article was factually correct and reflected what many professional economists have been saying about the affordability and effectiveness of corporate tax cuts. As a piece of analysis, it naturally will have a point of view, I offered. One could question whether the rigid distinction between factual reporting, analysis and opinion, expressed in the ABC guidelines, are as clear-cut as Mr Sunderland imagines or would like. Every piece of journalism, even a just-the-facts account of a car crash, has a point of view. The notion of the journalist as a kind of outside-the-system cyborg, totally detached from the world they are describing is really rather naive, particularly in an age of social media where the audience can talk back. University of Western Australia media academic Steven Maras calls this expectation of faux objectivity “frame blindness”. Frame blindness describes a situation where journalists fail to recognise the ideological nature of their own framing of issues. Framing relates to a key dilemma in journalism. On the one hand, reporters provide just the facts. On the other hand, they are teachers and storytellers compelled to draw on frames to educate, persuade and entertain. The dominant frame in economic and finance journalism for nearly four decades has been the acceptance of neoliberalism as the organising principle of society and the economy. So lower taxes are assumed a priori as an economic good, as is private ownership over public, less regulation rather than more and “market” solutions over publicly driven ones. We have been living with the consequences of not questioning that automatic framing since the global financial crisis of 2008. Now, we are starting to see challenges to these assumptions, and not just from voices on the left. One critical role of a public broadcaster, in an age dominated by self-interested media conglomerates, is to challenge accepted frames and to ask questions that risk annoying politicians who assume the answer to every policy question is to tax and spend less. In contrast, the more that journalists are expected to write as if they are standing outside and above it all, the more they are likely to be comfortably embedded, inside the machine, without being aware of it. It’s hard not see this episode as another example of the ABC being nobbled by the culture warriors and the neoliberal IPA types who resent its very existence. Its hyper-sensitivity to any analysis that may stir those beasts means it inevitably errs on the side of shutting down voices on the left, or just as bad, parading a "view from nowhere" blandness that just reinforces the existing power structure and offers no balance to the dominant view of the corporate-owned media. This pattern of undermining public broadcasting and censoring independent-minded journalism is part of a global attack on democratic institutions and free expression. Against that background, Emma Alberici’s greatest sin was not so much expressing a point of view but daring to tell some uncomfortable truths. This story was originally published on The Failed Estate under the title,'Uncomfortable Truths' and has been republished with permission. You can follow Jim Parker on Twitter @MrDenmore. "I didn't detect any factual errors and the quotes she attributed to me were accurate and in context." It adds up. Subscribe to IA.